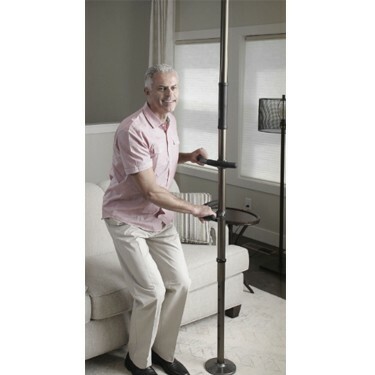 You love the comforting feeling of your home, and now with the Sure Stand Security Pole from Signature Life you can have the support you need to stand safely without changing the look and feel of your home. The Sure Stand Security Pole is tension mounted, so it can be installed anywhere in the home without drilling holes in the floor or ceiling. Two fully adjustable handles can be oriented at custom heights and directions to fit your needs. Best of all, the Sure Stand Pole comes in two highly attractive colors to match the style of your bathroom, living room, or bedroom. I now have 2 of these poles installed in my parents home. They make it so much easier for my father to get up and down from the dining table and his easy chair. He also uses them to help with stability going from point to point. Pros:Easy to install, and works with angled ceilings. Cons:The adapter for angled ceilings almost doubles the price from a standard flat ceiling pole, which seems excessive. Very secure though, and so far the best option I have found. This supplier accepts return of new, unused items in the original retail packaging, in re-saleable condition within 30 days of purchase. All documentation, warranty cards, manuals and accessories must be included. Contact Customer Service at 888-746-2107 Monday - Thursday 9 AM ET - 8 PM ET, Friday 9 AM ET - 5 PM ET for a Return Merchandise Authorization number and return address.